A sizable Texas school district is the latest in that state to adopt technology that allows students and others to report incidents anonymously that school officials want to be informed of, such as bullying, gang activities, and other more sensitive topics, such as drugs or cutting. 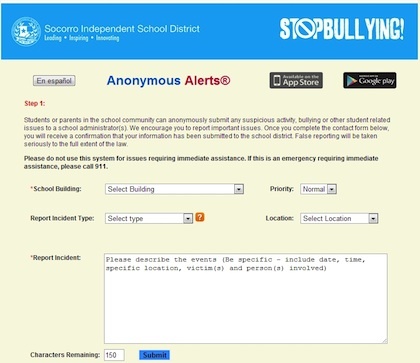 The Socorro Independent School District has adopted Anonymous Alerts from Message Logix for use among its 44,000 students. The students and others can also download free app versions of the service to run on their iOS and Android devices. Users, which can include parents and staff, are supplied a login and password from the district to activate the mobile apps. To report an incident, the user pulls up a short form to provide details. The mobile version of the program also allows for submission of a photo taken with a smartphone. Once the information is submitted, the person will receive confirmation that it has been sent to the school district. The individual doing the reporting also has the option of setting up a dialogue with school officials; even in that event, identity can remain anonymous. Anonymous Alerts allows users to pull up a short form to provide details about an incident for reporting. "Our top priority is student safety and providing our student community with mobile and Web-based tools to quickly reach out about sensitive issues," said Fernando Vasquez, assistant director of the district's state and federal programs. "Our students can open up anonymous one-way or two-way conversations with our principals through private messages, while protecting their identity, therefore prohibiting peer retaliation."